Today, when you order "Merlins Coin Safe by Merlins Magic", you'll instantly be emailed a Penguin Magic gift certificate. You can spend it on anything you like at Penguin, just like cash. Just complete your order as normal, and within seconds you'll get an email with your gift certificate. Order in the next 9 hours 32 minutes and it will ship TODAY! They are back at last! Our own prop builder used to make these for us fifteen years ago. When he retired we struggled to find anyone who could make them to the same standard. We have now found a local craftsman who is able to make them to the high standard we require. In effect the magician displays a small wooden box. 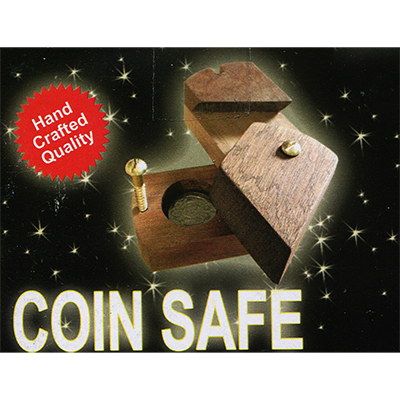 The box is opened and a coin can be seen inside. The box is passed to a spectator and they are asked to remove the coin. Try as they may they cannot open the box. The magician retrieves the box and opens the box instantly! the open box is handed back to the spectator for them to close...now they cannot close the box!! This is a great ice breaker and loads of fun, very easy to do.....when you know the secret.